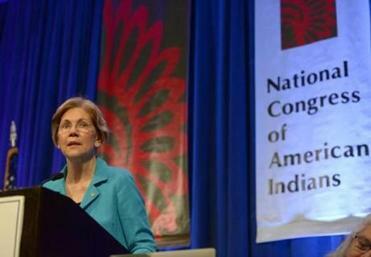 Senator Elizabeth Warren is calling on President Trump to follow through on his pledge to donate $1 million to the charity of Warren’s choice if she takes a DNA test proving her Native American heritage. Warren on Monday released the results of a DNA test that provides “strong evidence” that she had a Native American in her family dating back six to 10 generations. In a tweet Monday morning, Warren said Trump should direct the funds to the National Indigenous Women’s Resource Center, which works to stop domestic violence targeting Native American women and children. Since 2014, Trump has repeatedly taunted Warren about her controversial claim to Native American heritage, using the slur “Pocahontas” and saying he would challenge her to take a DNA test if she ran against him for president. At a Montana rally in July, Trump said he’d pose the challenge should the two ever meet in a presidential debate, while also criticizing the movement of women speaking up about sexual harassment: “we have to do it gently because we’re in the ‘Me Too’ generation,” he said of the DNA test. “And we will say, ‘I will give you $1 million to your favorite charity, paid for by Trump, if you take the test and it shows you’re an Indian,’ ” Trump continued. Speaking to reporters on Monday, Trump denied he ever said that he would pledge the money. “I didn’t say that. You better read it again,” he said outside the White House. Asked about the results of the test, Trump dismissed the issue as unimportant: “Who cares, who cares,” he said. However, when a reporter asked again Monday evening about the money he promised if Warren took a DNA test, Trump replied, “I’ll only do it if I can test her personally, and that will not be something I will enjoy doing either,” according to a pool report. He also said Warren owed the country and apology.